Orders with shipping charges under $10 are sent via US Postal Service. All other orders are sent via Fedex or UPS. Tracking numbers are available via online status on each order. Curtain-tracks.com uses the heaviest shipping tubes available to ensure that the tracks arrive in good conditions. UPS and Fedex charge higher shipping costs for these long tubes due to their irregular shape and the need for special handling. Please understand that expedited orders (Next Day and Second Day) must be received by 2 pm Central time in order to ship that same day. Orders placed after 2 pm are shipped the following weekday (Monday-Friday). Expedited orders are only shipped and delivered Monday through Friday. If a tube arrives that has obviously been damaged during transit, refuse the shipment, notate the damage with the driver, and notify us so that a replacement shipment can be sent immediately. If your damaged package is dropped off at your address, contact Curtain-Tracks.com so a pickup and reshipment can be arranged. Be sure to check all the contents of the shipping tubes, as smaller accessories can sometimes be misplaced as the items are intermixed with packaging material. Also, note that the tracks are typically interlocked during packaging to avoid damage during transit. Check to be sure the tracks are not interlocked before reporting an incomplete order. Please note that orders shipped outside the US may incur incremental charges associated with duties, taxes, tariffs or brokerage fees. The customer is responsible for these charges. CURTAIN-TRACKS.COM IS NOT RESPONSIBLE FOR ANY OF THESE INCREMENTAL CHARGES. If you have questions regarding any additional fees you may face with regard to your order, please contact UPS (www.ups.com) or Fedex (www.fedex.com) directly to discuss a possible shipment. Shipment of tracks longer than 8 feet can be arranged via freight carrier. Call us at (888) 434-7444 to arrange this service. Prices for this service vary depending on location. 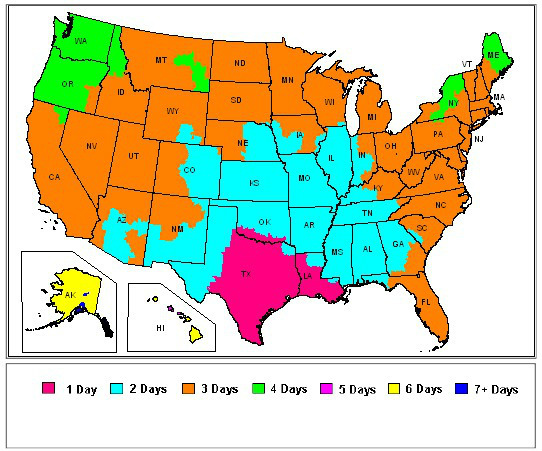 Below is a map outlining the Fedex transit time guidelines for Fedex Ground shipments from Houston, Texas.